This is an extraordinary puzzle by Schmidt that it is very difficult to find today. 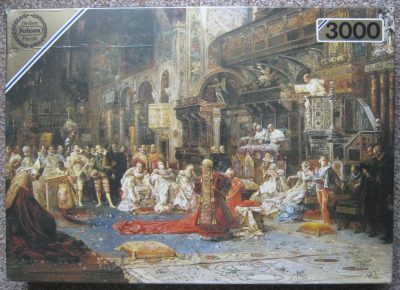 It is a sheer delight for the puzzle fan, due to the amount of color and detail. The title is Beautiful View, by Cornelia Ellinger. The puzzle is like NEW, with all the pieces SEALED inside the original plastic bags. The box and the poster are in very good condition. Puzzle size: 289 x 137 cm. Other titles: Blick nach Draußen; Terrazza Sul Mare; Vista hacia fuera; Vue Idylique; Vergezicht; Vista da Varanda.